Writers have always been enamored with the contradictory soul of the American South. It is after all, a land of conflicting labels. Its reputation for warm manners, good neighbours and straightforward outlook on life sits awkwardly with a history of racism, religious intolerance and violent martial law. With a welcoming smile on its face and a loaded shotgun in its hands, it’s a subject that the average commentator would be well-advised to approach with caution. But it’s one that many have attempted to critique nonetheless. The written works of Twain and Faulkner  are classic literary examples that highlight the Rebel states’ tumultuous past. The silver screen meanwhile has often been less than kind, at least if movies such as Deliverance and 12 Years A Slave are anything to go by. 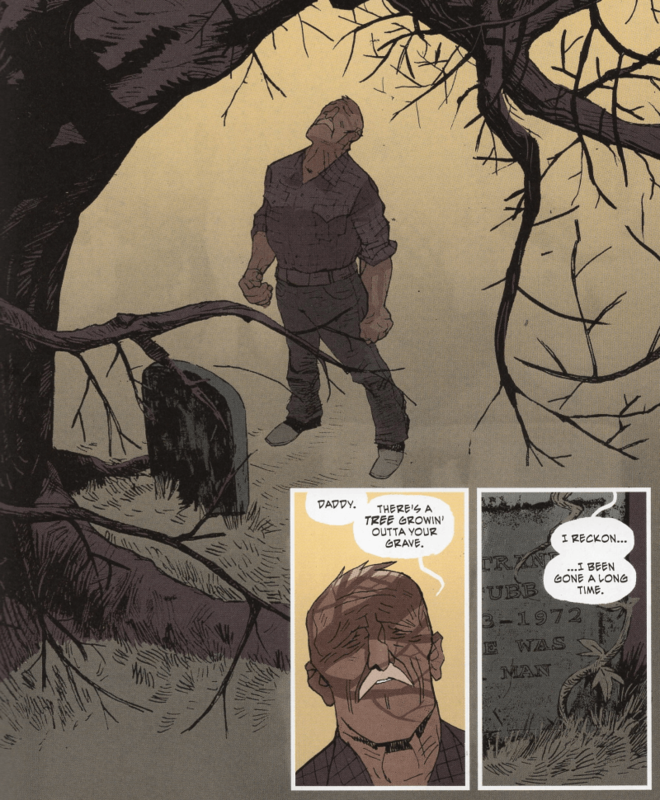 In spite of these, the medium of graphic crime novels has been lax in putting its lens on America’s most culturally staunch region. It certainly would make a fascinating setting for one though - and that’s probably why Southern Bastards, an uncompromising tale of murder, football and unwelcome returns, has come to fruition. Southern Bastards: Hardcover Book One contains the first two volumes of an ongoing series penned by Jason Aaron (Ghost Rider, Wolverine, Men of Wrath) and Jason Latour (Loose Ends, Wolverine and the X-Men, Winter Solder), two proclaimed Southerners who undoubtedly possess the personal knowledge to cast a perceptive light on the darker realities of their homeland. Here, the pair have concocted the opening episodes of a taut crime saga that revels in unexpected plot twists just as much as in disclosing humanity’s savage undercurrents. Specifically it begins with the story of Earl Tubb, a former resident of Craw County, Alabama, who has decided to return home after years away to pack up what remains of his father’s old estate. It’s a homecoming that isn’t going to be met with open arms from the locals. Far from being an idyllic rural paradise, Craw County is a backwater wallowed in fear and loathing - oldboys rule supreme, and bloody retribution is the tool that dictates power. It’s a tool that’s been wielded best of all by Coach Euless Boss, who doubles as both head coach of the locally-worshipped Runnin’ Rebs football team, and as overlord controlling every aspect of Craw County life in the years that Tubb has been away. Euless’ status as boss of the county (pun maybe intended) runs directly in conflict with Earl’s who, coincidentally, is the son of an Alabama sheriff  that once delivered justice to the undesirables plaguing it when he was a kid. While Earl had no interest in following in his father’s footsteps (flashbacks show he was happy to trade Alabama for Vietnam and the US Army as soon as he was old enough), the boondock community he’s come home to doesn’t take too long to expose its vicious, bloodthirsty way of life - a way that gets him in the mind for exacting righteousness. A brief encounter with an old acquaintance, Dusty Tutwiler, ends with Earl being warned to leave the county as fast as he came here. 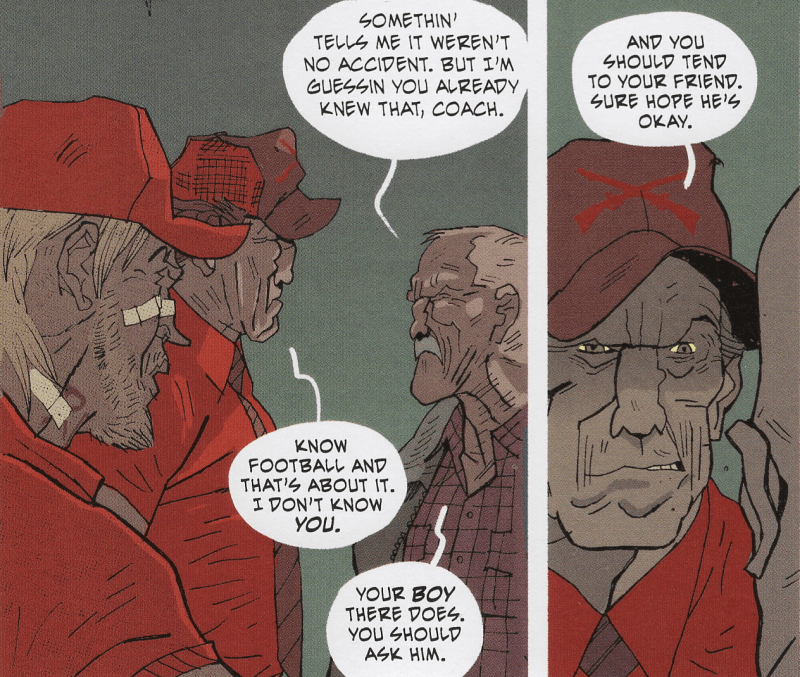 Failing to heed Dusty’s ominous words, Earl then promptly saves him from the punishment of Coach Boss’ henchmen, who are out for Dusty’s blood as failure on his part to pay a debt. It’s an act of valour that turns out to be in vain. Dusty is again set upon again later in the evening, and this time is brutally beaten to death by the very same men. Conflicted by his inability to save him and his own anger at how his hometown has become so disreputable, Earl is left with a hard choice to make. He can either get out, and go back to the safety of ‘big city’ Birmingham where he now resides, or bring a change to the county whatever way he can - which typically in Southern terms, loosely translates to beating the county’s ruling rednecks around with a giant stick and driving them out. Naturally, he chooses the latter option. 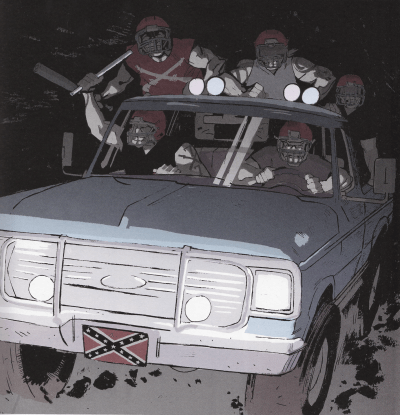 Southern Bastards is thus a pretty hard-hitting graphic novel. It’s definitely not laden with overt bloodiness or anything outlandishly shocking, but it is nonetheless a mature visual story tasked with the telling of dirty men using dirty means to achieve dirty ends. Profanity and wanton assault are almost the normal means of interaction among its characters, and for every bit of stoicism and toughness that is imbued into its heroes, there is a complimentary abundance of cunning and psychotic rage suffused into its villains. 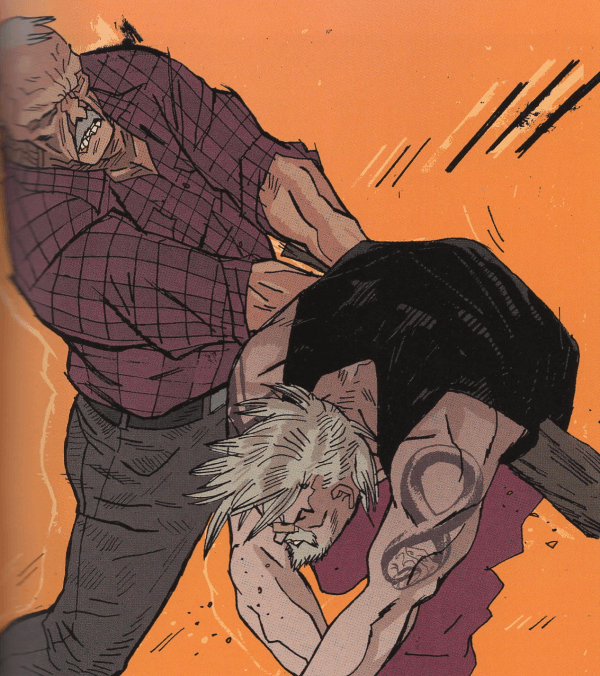 All these traits are brought brilliantly to life by a jagged, viscerally murky art style that seems almost scratched into each page and brushed in color tones that elicit the feral rule of law that dictates these southern badlands. But there’s also a particularly southern pastime that its storytelling uses to sustain this animalistic edge as well. 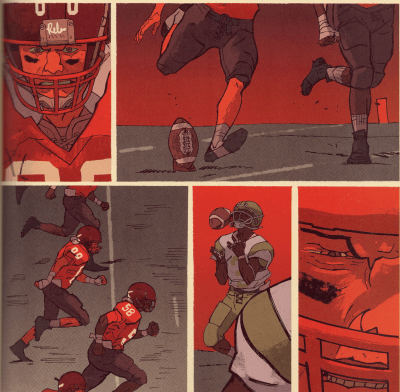 Football features very heavily throughout - Boss’ men don the uniforms to break bones off the field as well as on it, and both the field of America’s Game and the fortunes of the Craw County Runnin’ Rebs serve as  symbolic platforms for the development of both drama and character alike. Whether the throwdown comes from the swinging of giant tree branches or the rush of a defensive end, Southern Bastards has no problem exhibiting its violent, electric dynamism in multiple ways. For all the carnage that unfolds on its pages however, this hardcover’s two volumes also contain the foundations of an incredibly shrewd crime saga. The first half of the book might not indicate this, given that Earl Tubb’s campaign of revenge unfolds in particularly uncomplicated fashion - indisputably borrowing an idea or two from from other ‘lone hero’ features in the process. But it is at the halfway point that Southern Bastards: Book One reveals some impeccable twists, as well as new characters, which collude to turn the plot from skull-cracking vengeance yarn into a crime-noir of more elaborate implications. It would be a dreadful shame to give its revelations away - to do so would be an injustice to just how cleverly-weaved its individual plot elements are, especially the fascinating insight that the second half offers on Coach Boss’ formative years. Simply reading the opening volumes of Southern Bastards is enough to know that there is a genuinely great tale unfolding here, that supports its cacophonic flurry of primal violence with a surprising amount of introspective nous. Better still, It’s also a story that doesn’t waste too much time filling in blanks, keeping its gaze fully on the central plot and the characters that matter. Some of its support cast might suffer from a lack of subtlety as a result (Esaw and Materhead, Boss’ right-hand men, are just standard rednecks at this point despite being focal figures). But it’s an oversight easily forgiven considering the merits of the visual prose already present. A telling sign of its quality is also in how enjoyable it reads on repeated run-throughs as well. Small, engrossing details that are kept hidden away from initial examination reveal themselves on further read-throughs and serve to deepen Craw County’s mythos, as well as make its supposed heroes morally greyer than introductory intrigues might indicate. With this dose of intentional and necessary ambiguity, Southern Bastards reserves plenty in its holster to keep avid readers on the hook. At this time in writing though, there are still too many open threads in Southern Bastards’ bloody web of hate in the Dixie states to know for sure if it will stand among the classics of the crime genre. That’s an answer that either the latest issues, or its third compilatory volume, Homecoming (released in June), could provide based on your patience. Luckily for now, it’s off to a great start - each loose end carries more than enough muddy suspense for this series to be worth diving into. Like a chicken thigh sizzling in a deep fryer, there is something very tasty bubbling under the surface of this portrait of smalltown Alabama, and the odds are looking good too that we’ll get a conclusion that’s just as enjoyable as its first bite.